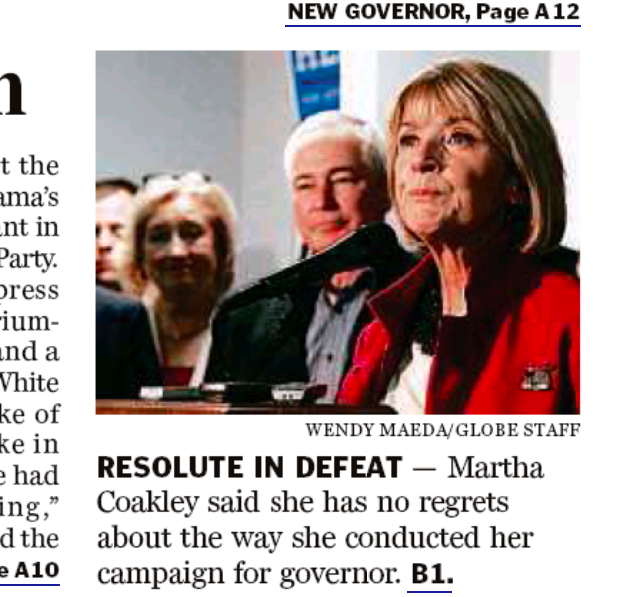 Is it just us, or did the Boston Globe bend over backwards yesterday to sponsor the Martha Coakley Victory in Defeat Tour? In fact, they’d left them behind months ago, but some critics hadn’t noticed. Tuesday showed them. There was undeniable redemption in Baker’s victory, and, however painful it had to be, in Coakley’s narrow defeat. THIS TIME, no one could say Martha Coakley gave up the fight. In fact, she didn’t formally concede the governor’s race to Republican Charlie Baker until Wednesday morning. Forgive her if she hung on a little too long. Sorry, Joan – Boston Herald editorial page editor Rachelle Cohen doesn’t forgive her. In politics as in life there are right ways and wrong ways to do things. How unfortunate that Martha Coakley had to end her political career on such a sour note — choosing the wrong way. With hundreds of her supporters still in the Fairmont Copley Plaza ballroom as election eve turned into morning, Coakley slipped out and headed home. The job of telling the crowd to go home fell to her running mate, Steve Kerrigan, who told supporters, “It’s going to be a long night or rather a long morning” and urged folks to head on out. This entry was posted on Friday, November 7th, 2014 at 10:38 am and is filed under Uncategorized. You can follow any responses to this entry through the RSS 2.0 feed. You can leave a response, or trackback from your own site.